This month, our progress has focused on the interiors of the Saban Building and David Geffen Theater. In the Saban Building, we are continuing the buildout of the escalator system in the Lobby and Mezzanine areas. In the gallery spaces, drywall installation is ongoing, and the Level 3 gallery walls are being primed for painting. Drywall is also being installed in staff and conferences areas. Mechanical, electrical, plumbing, and fireproofing work continues in the public restrooms on all levels. We are also installing the tech grid that will support lighting and audio visual components for gallery spaces on Level 4. In the Ted Mann Theater, we have completed work on both the seating framing and the rough installation of our HVAC system. 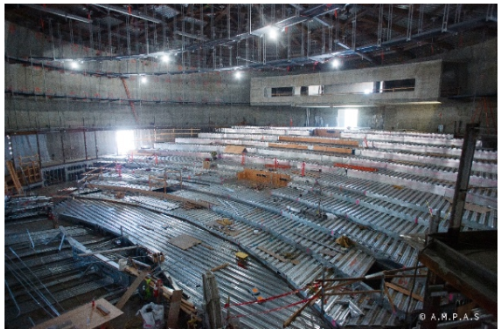 Inside the David Geffen Theater, we have completed the concrete pours for both the lower and upper seating slabs. In the projection booth, fireproofing installation continues. Simultaneous to the Academy Museum’s construction, Metro continues work on the forthcoming Purple Line Extension. Visit metro.net/purple for more information about Purple Line Extension construction. Thank you for your continued support as we build the Academy Museum of Motion Pictures.